How To Remove Water Stains Or Burns From A Wood Table Easily! You are here: Home / DIY / How To Remove Water Stains From A Wood Table Easily! My daughter and her husband own a resale business and my daughter is in charge of cleaning, repairing, and refurbishing items before they resell them. She learned how to do most of the repairs through trial and error. Make Your Old Shoes Trendy Again Quick & Easy! Pre-Teen Room Makeover Under $50! 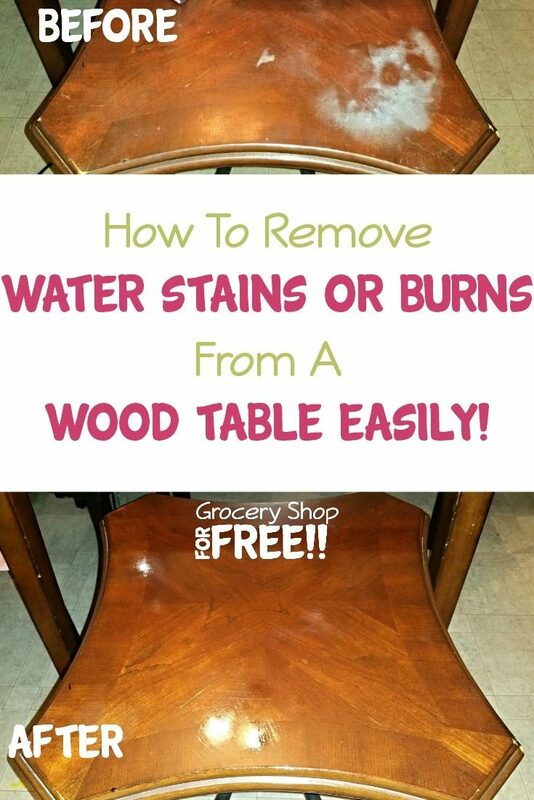 This is the best way I have found to fix burns and/or fix stained wood easily on various wood tables. I have had many of these stains myself from my kids spilling a drink or setting a hot pan of cookies on it! This has worked every time to remove watermarks from wood tables I own and ones I have sold. It’s so simple and easy. Let’s get started! Lay the towel over the marks and rotate the hot steam iron over the stain for about 3 to 5 seconds. Use the towel to rub the area you just heated with the iron to remove the moisture left by the steam iron. Check the spot if it is still there and repeat until it is gone. For me it has taken up to about 6 times to get the desired result. After removing the marks use a little polish to get it looking good again. That’s it – How To Remove Water Stains From A Wood Table! That’s all there is to it and it takes just a couple of minutes and you’re all set! You will NOT believe the AWFUL AWFUL couch she made look brand new again! I want to thank you very, very much for the above information. Thanks for this! Me and my piano have a date with our iron this evening! Do you think this would work on a pee spot on my dining room table? One of the cats piddled on the table, not sure how long it was there, but the surface is lifted. Will the heat steam the surface back down? It should work! Since it is lifted I would try it without steam first and then with steam, if needed. If there’s a smell also you’re trying to fix I would try letting some baking soda sit on the area just pour it right on there for about 30min-1hr. You used a steam iron on dry or with steam. Hang on that’s how I made the mark in the first place! I thought I’d iron something on my wood table. Put a towel to protect it but the steam obviously went through and now I have pale ghosting on the areas that I applied the heat and steam to. So confused. The trick is to just heat the wax a little bit so it adheres to the wood again. It probably got really hot if it was being ironed on. Just do it 30 seconds at a time to prevent permanent damage. Since the wax may already be permanently damaged you can try something I have done before. Polish the table top with a little lemon essential oil, orange oil, olive oil, or avocado oil. Then try the iron again. If that fails there’s a product you can try. It works for me sometimes, but, not all the time. The oils listed above I have used and always seem to work. Any 1 of them should do the trick.